The Model United Nations of the University of Chicago (MUNUC) is a four-day academic conference that provides high-school students from around the world with the opportunity to meaningfully engage with contemporary world issues, polish public- speaking and communication skills, and become more confident and articulate global citizens, under the mentorship of thoroughly trained and deeply passionate University of Chicago undergraduates. To educate high-school students in the arts of debate, negotiation, and public speaking by providing a forum in which they can hone their skills. To introduce students to the fascinating realities and complexities of international relations through simulation of international organizations. To underscore the potential of the United Nations in resolving international problems while demonstrating its limitations. MUNUC’s annual conference in downtown Chicago ranks as one of the best in the world, attracting over 3,000 students from across the United States and around the world. The thirty-one different committees we host at our conference each year span a breadth of issues, formats of debate, and time periods. Past simulations have included the UN Disarmament and International Security Committee, the Congress of Vienna, the United Nations Children’s Fund, and the Arab League. 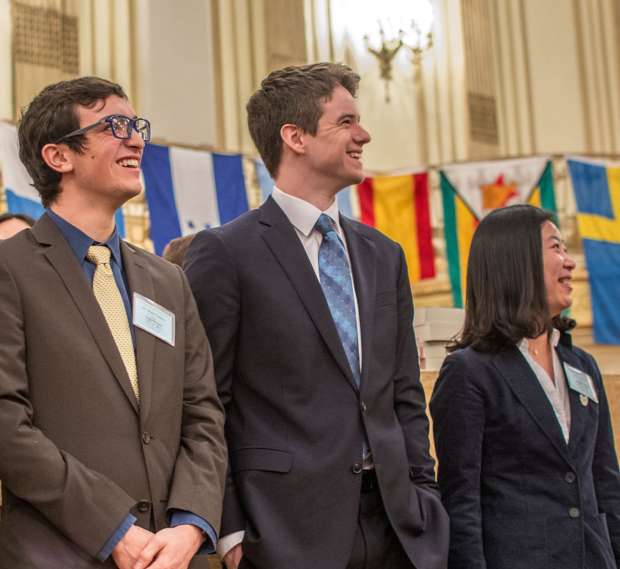 During the rest of school year, MUNUC members go into high schools in Chicago to lead weekly programs that help youth build foundational skills in communication and research, and to introduce them to global affairs and the concept of Model UN. MUNUC also co-hosts a number of events in Asia in the summertime, working closely with locally based educational partners. Across our programs, MUNUC is distinguished by its emphasis on pedagogy. This educational focus is reflected from thorough background guides that make accessible complex world issues, to the integration of crisis elements into the traditional Model UN setting to create responsive committees, to our system of continuous feedback during conference that helps bolster students’ confidence and encourages them to take risks.